Lately, it seems that I don’t have much time to cook. The days just seem to go by so quickly. Even when I’m not working, there is always something to be done around the house, some errand to go to, or some appointment to bring someone to. Of course, this doesn’t leave much time for cooking during the week. No time + fall weather equals soup in my mind. I love soup. I could probably have soup daily once the weather cools. 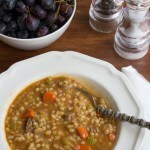 It’s quick, it’s often healthy, and it’s filling….which brings me to this beef barley soup. I’m happy to report that this was a big winner in our house this week. I made a lot and leftovers were gone within 1 day. That’s always a good indicator, isn’t it? This recipe is very simple, just some chopping and sauteing involved in the initial stages. The soup thickens the longer it sits, so leftovers will be thicker than after it has just been cooked. 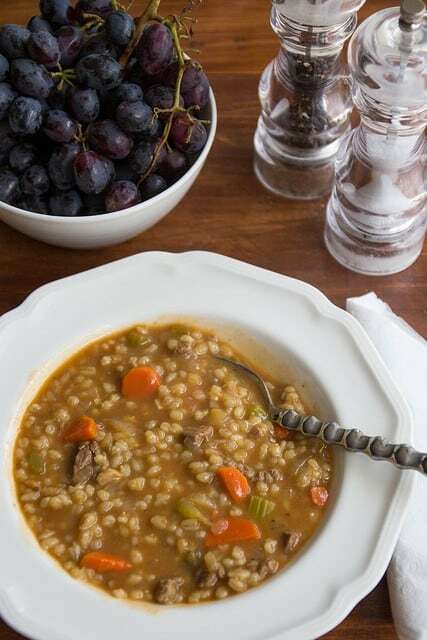 Of course, this is an easy recipe to tailor, so if you want it thinner you can either increase the amount of beef broth or reduce the amount of barley. And, vice versa of course if you want a thicker soup. Serve this with a big ole salad and some warm bread for the kids, and call it dinner! Bring the soup to a boil and then reduce heat to low and simmer for about 1 hour 15 minutes or until barley is cooked and vegetables have become tender. I just made this for dinner tonight and it was so good! I added a little extra barley and a few sprinkles of basil for some extra flavor and it was delicious! Thanks for the recipe! !